Tiwani Contemporary is pleased to announce Arquivo Urbano, an exhibition of new works by Délio Jasse. Jasse is known for his experimental photographic work, in which he often interweaves found images with clues from past lives to draw links between photography and memory. The exhibition highlights Jasse’s ongoing interest in capturing and re-imaging the urban landscape of Luanda through photography; and focuses on works from the series Arquivo Urbano (2019), Sem Valor (2019). Sem Valor (2019) captures the ‘boom and bust’ atmosphere of urban Luanda – the capital of the Angola. Based on material Jasse shot in the city between 2013 and 2018, the series sketches an elliptical portrait of Luanda which witnessed a rapid economic development in the early noughties after 30 years of civil war, followed by a catastrophic crash as oil prices collapsed in 2014. Deeply affected by the crisis, the urban landscape of the city was left disfigured as ambitious projects by developers went bust and building-sites were suddenly abandoned. Currently, Luanda is home to 7.8 million people and projected to double by 2030 to become a ‘megacity’. Jasse transformed his original photographic material into pictorial works with a manifest painterly quality. His layered and entirely analogue process involves hand-painting with light-sensitive emulsions, long exposure times (directly to sunlight) and gold leafing. The resulting images show carefully selected views of Luanda: a block of flats, a new high-rise, an old colonial building. Luanda, a bustling city appears still, deserted and haunted by the ghosts of Angola’s past: the broken promise of globalisation, the violent Angolan civil war, and five centuries of Portuguese colonisation. The prints are overlaid with gold leafed words, lifted from an old rotating stamp used to imprint paperwork: ‘urgente’, ‘copia’, ‘liquidado’… Images of urban (de-)constructions appear overshadowed by the metallic weight of authority. The definitive slogans, bold and bright, stand out in relief against the dusty, fading, grayscale landscapes. Jasse, who experienced absurd administrative conundrums when applying for Portuguese citizenship, has always been interested in questioning the notion of an ‘official’ document, and its arbitrary relationship with truth. The gold embossing belongs to a different world: of wealth and ostentatiousness; hinting at the deep economic divide within Angolan society. The pairings between words and images are somewhat perplexing and open up, by means of unexpected word-image associations, a line of critical enquiry on Angola’s recent history and the present-day challenges the country faces. 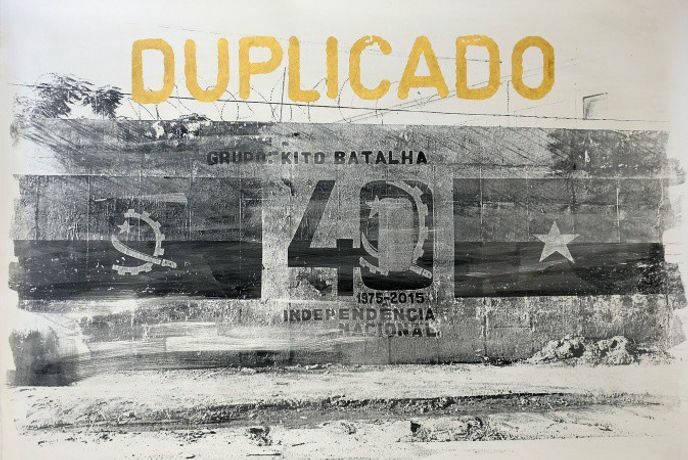 One of the photographs shows a mural commemorating the Angolan independence of 1975, and depicting the Angolan flag alongside that of the MPLA, the political party that has ruled Angola for over four decades and facilitated the country’s political journey from Marxism to capitalism. In another print, a deserted beach on the Ilha do Cabo alludes to the environmental challenges faced by the inhabitants of Luanda as it struggles with high temperatures and water shortages. In Arquivo Urbano (2019) - a series of prints on ortho film, Jasse reworks his own photographic archive and juxtaposes negative and positive shots of noted landmarks in Luanda. A hybrid work, this series encompasses Luanda’s colonial Portuguese buildings, its modernist architecture promoted by Vasco de Vieira da Costa and Fernão Lopes Simões de Carvalho between the 1940s and 1960s, and the new, international corporate style propelled by globalisation - embracing their unruly appeal. Working with film, black and white images, positives and negatives - Jasse’s work points to the past but additionally, the nature of the photographic process to create the images alludes to a utopian architectural future for one of the fastest expanding cities on the African continent. Jasse’s exploration of the photographic archive and architectural hybridity is further explored in Darkroom (2013), a slide installation on loop which remodels Jasse’s photographic archive as it brings together a live series of projected images.